Look at that AMAZING thick layer of coconut creamy mousse goodness! 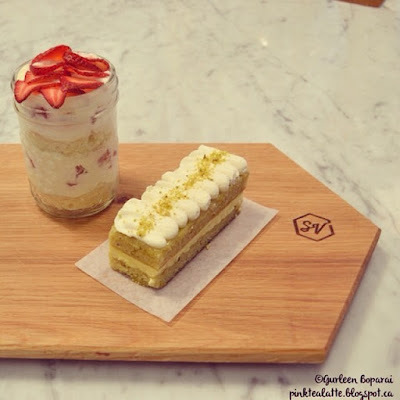 For August, I am going to be hitting up my favourite bakeries in town and I am starting with the Layer Coconut Cake from Small Victory! Small Victory is a fabulous bakery nestled in Yaletown Vancouver. With their chic interiors and fabulous staff, this bread & coffee house has some to die for cake. Their layered coconut cake is amazingly light, creamy and fluffy that leaves you licking your fork day dreaming for more. They have done a fabulous job by keeping the cake airy by having a layer of some sort of coconut mousse pudding. 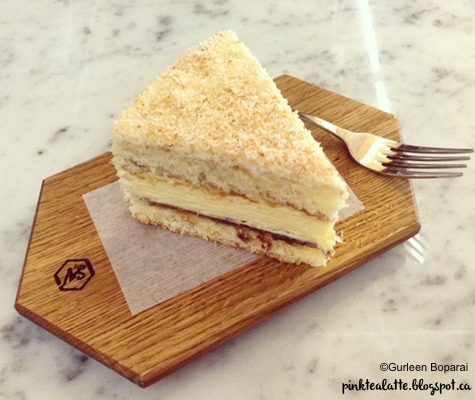 I just cannot explain it, but its what really makes this coconut cake stand apart from the other bakeries! Plus, the cake's flavour is really delicate because they did not over power it with sweetness! I am sure you have had a slice of cake before where you are only a bite in and the sweetness is just too overwhelming for you to take another bite. It is just refreshing to have a cake with developed flavours that really makes you appreciate the coconut and craftsmanship! Now me being me, you know I sampled a few more goodies! The strawberry short cake is presented in a mason jar which is super cute! Nothing extraordinary just lots of fresh whipped cream, cake and fresh strawberries! The Pistachio Cake is presented in a rectangular format which definitely makes it stand apart from the sliced cakes. SO YUM! I love pistachio, places need to do pistachio ice cream more and more pistachio cake! It is a little on the sweeter side; however, it is a must try! But Small Victory's Coconut Layer Cake is the winner for me! 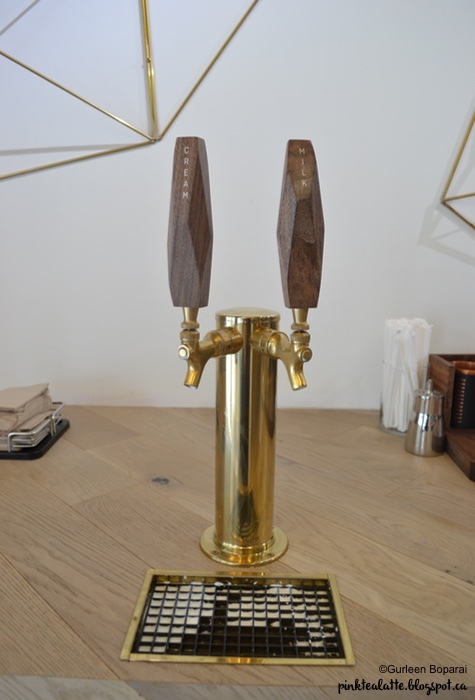 Okay, so can I please have this Milk Fountain installed in my home because it is so Chic! Let me know what you think of Small Victory's Layered Coconut Cake and what other bakeries I should hit up for Coconut Cake!